All internet orders qualify, 32 prizes, total prize value of £3500! 32 prizes over 31 days. As usual we start the year with an amazing giveaway by Fire-Support. Every day a winner is drawn from the qualifying internet orders that day. Prices are announced daily on their facebook page! At the end of the month all qualifying entries from the whole month then go into a final draw to win a Marui DEVGRU upgraded worth over £700 GBP. 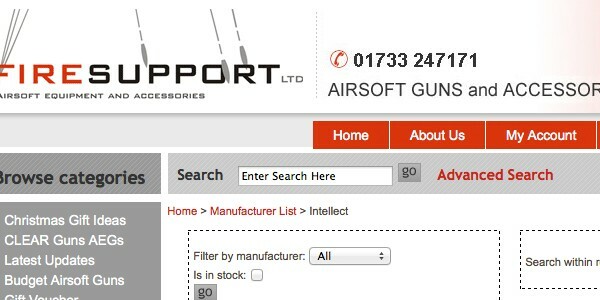 Gun prizes in UK can only go to members of insured airsoft sites or UKARA registered players, rest of Europe can win any prize (additional postage will be needed from non-UK mainland winners). Prize winners and prizes announced on facebook every day! Good luck to all our readers! Enjoy even more Airsofting in 2019! Big Christmas sales at Gunfire! Don’t miss the best deals – only today 29%OFF over 2500 products! 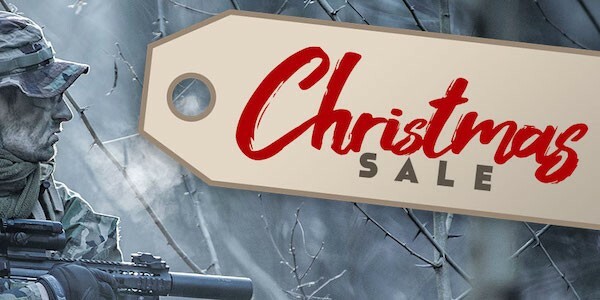 It’s time for Christmas Sale at Gunfire! That’s not all! Each new reindeer carries a new pool of products that we will add to the promotional offer. Therefore, check their website to see the new items on sale and catch the reindeer with the highest discount! For starters, we have over 2,500 products cheaper by 29%, including G&G, JG, Classic Army or Specna Arms airsoft replicas, parts and accessories from Alta Tactical, Armorer Works and Guarder and tactical equipment from Primal Gear, FMA and Ultimate Tactical. Additionally, during the whole period of the promotion, you can choose from a group of products that are discounted by 15%. Don’t wait and collect best deals from our Christmas tree before they’re gone! 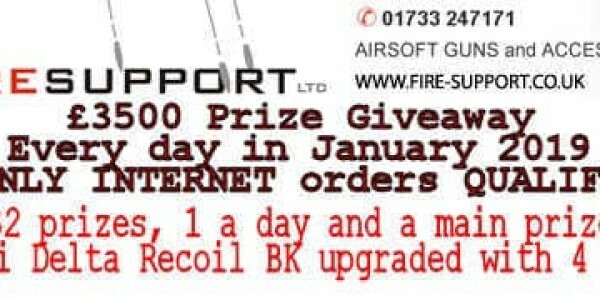 For those who are into ICS pistols might want to check this special offer by Firesupport from the UK! They offer a special discount where you save £89! You get the ICS Alpha BLE GBB Pistol with 2 Extra Magazines. You can chose the black, tan, tan-slide or tan-frama version. The advanced ICS ALPHA BLE GBB follows the standards set by ICS rifles to bring you a high quality, high performance pistol. The ALPHA features ambidextrous slide stop and ambidextrous magazine catch, thus being ideal for both right- and left-handed shooters. WGC will be relocate during Feb 2018. Check their discounts! Our partner WGC SHOP informed us about their warehouse relocation plans during Feb 2018! Instantly benefit from their sales and check their discounts. Be aware: Orders payed before 28 Jan 2018 will ship out before 31 Jan 2018. 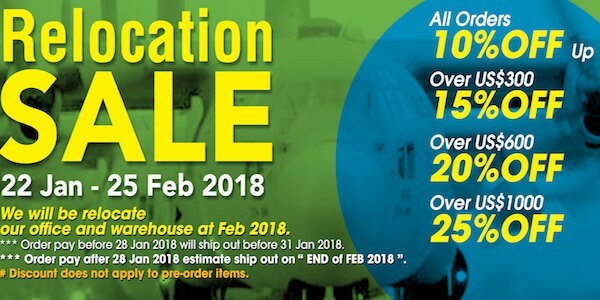 Orders payed after 28 Jan 2018 estimate to be shipped out by the end of Feb 2018. Also discounts do not apply to pre-order items! Till August 28th 12% OFF on everything! Guys, here is another great sale from Redwolf Airsoft! They provide you an instant 12% discount on their ENTIRE collection. Go and check their shop while this sale lasts (August 28th). 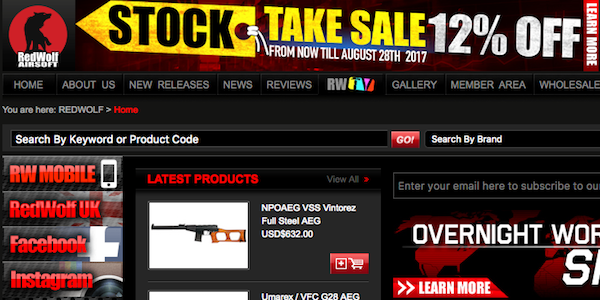 "RedWolf Airsoft is now having a Stock Take Sale before our annual stock take! This deal starts now till August 28th , 2017. Everything on our online store with be 12% OFF! Simply make the purchase on the website and checkout. No coupon code required." Copyright 2002-2017 NLAIRSOFT.COM | All rights reserved.